UPDATE: Since nobody selected Joaquin Benoit or Alberto Alburquerque as the first new Tiger, the book contest described below is still open. Your old predictions are still valid going forward. However, new guesses are welcome this weekend. Also, if anyone wants to change their previous guess, that is allowed this weekend. Again, if two people select the correct player, the first person who made the guess wins. Please enter you prediction for the next player added to the Tigers roster from outside the organization in the comments below. 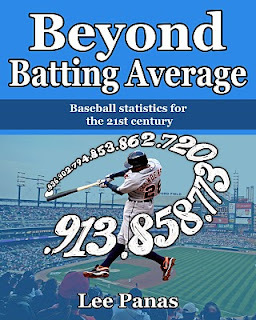 As many of you know, I published the book Beyond Batting Average earlier this year. It is a comprehensive and accessible sabermetrics primer for knowledgeable baseball fans, who want to learn more about all of the old and new baseball statistics. You can read more about the book at Lulu.com and Amazon.com. I am going to give away a free book to the first person to correctly predict the first player added to the Tigers 40-man roster from outside the organization this off-season. Please put your answer in the comments below. If more than one person guesses correctly, then the first person who answers correctly gets the book. Hi Lee: Justin Miller, because the Tigers need RPs, he won't cost too much, and his K/9 is high (which DD will like). I already have your book (two thumbs up) so on the off chance I guess right please give the book to the runner up. In case anybody gets any ideas, if Perlata becomes a free agent and then signs with the Tigers, he doesn't count. It would have been a clever choice, but I want the contest to be about new players. Hey, a guy can dream, right? Can we enter more than once?